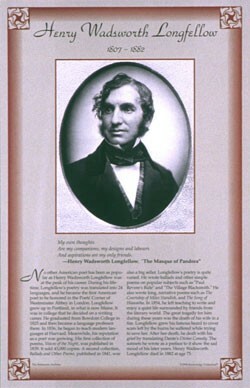 This unique educational poster features a photo of the great 19th century American poet Henry Wadsworth Longfellow, as well as a quote from "The Masque of Pandora," and concise biographical text summarizing his life and career. 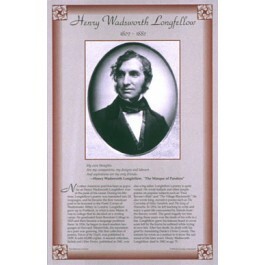 Unlike many other poets, Longfellow achieved great fame and recognition during his lifetime. He wrote short simple poems on popular subjects such as "Paul Revere's Ride," and "The Village Blacksmith," as well as long, narrative poems like "The Song of Hiawatha." This poster is a great way to introduce students to this classic American poet.